DeLaveaga Park: Service road into Lower DeLaveaga Park. Designated off-leash times are sunrise to sunset. Take Market Street past Gruenwald Court. 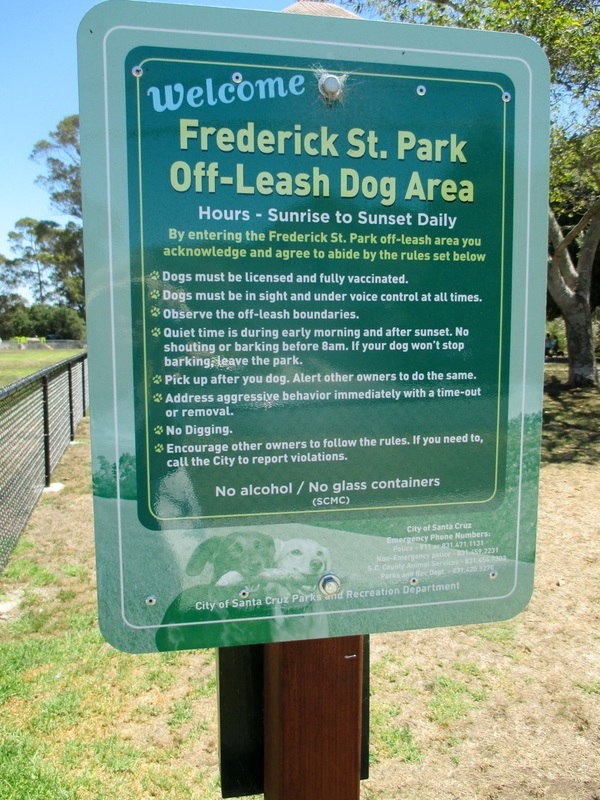 Frederick Street Park: The off-leash area is delineated by signs and a chain link fence. Off-leash times are sunrise to sunset. The area is located at 168 Frederick Street. Grant Street Park: The off-leash area is clearly marked with signs. Off-leash times are sunrise to sunset. The area is located at 180 Grant Street. Mimi De Marta Dog Park: Broadway Avenue at the San Lorenzo Levee. Open sunrise to sunset daily. Mitchell's Cove: Dogs are allowed off-leash before 10 a.m. and after 4 p.m. The beach is located near West Cliff Drive and Almar Avenue. 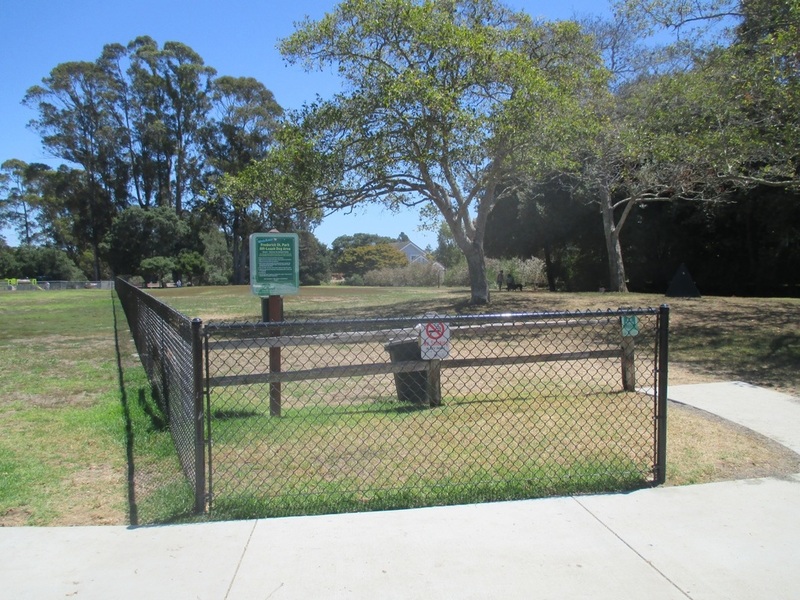 Pacheco Dog off-leash area: This area is completely fenced and the off-leash times are sunrise to sunset. The area is located at Pacheco Avenue and Prospect Heights. University Terrace Park: This area is fenced and off-leash times are sunrise to sunset. 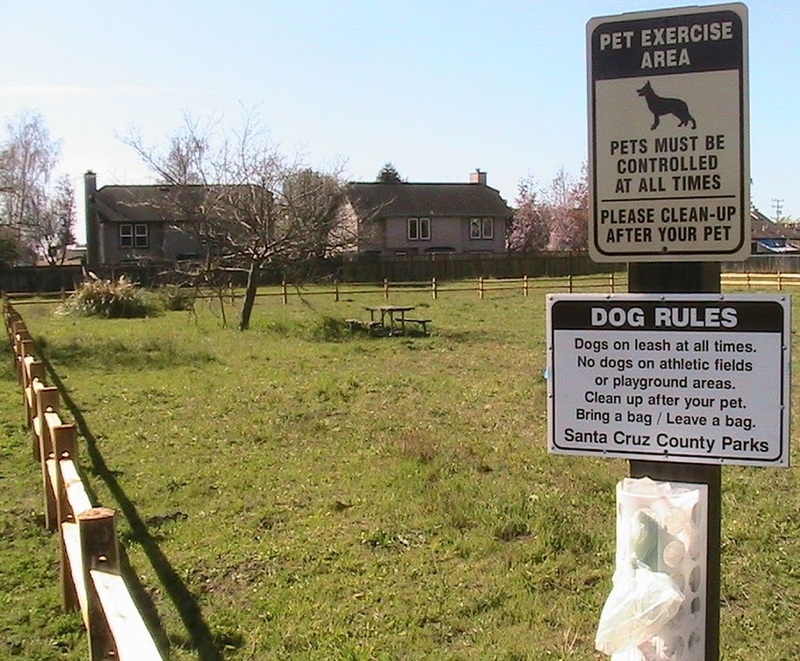 The designated off-leash area is located at the second entrance at Nobel Drive and Meder Street. Dogs are not allowed at the Wharf, Cowell Beach, Main Beach, Laurel Park, Moore Creek Preserve, and San Lorenzo Park. Chanticleer Avenue Dog Park. Location: West side of Chanticleer Avenue, about 1/4 mile north of Capitola Road. Polo Grounds Dog Park. Location: 2255 Huntington Avenue, Aptos, California. Fenced, off-leash area, including partitioned small dog section. Open sunrise to sunset. There is considerable confusion about "Seascape Beach." Seascape Resort does not allow dogs in any of its accommodations. Their property does not extend onto the sand, so the beach seaward of the Resort is County property, under County leash laws. Seascape Village is a gated private community that allows dogs on its property, which does not extend onto the sand. The adjoining Dolphin and Sumner beach to the west of Seascape Village is a county beach on which dogs must be on leash. Seascape Park to the east of Seascape Resort is a County Park that does not allow dogs off leash in the park or on the beach. If dogs are off-leash on Seascape beaches, their owners are violating County leash laws. Lodato Park.Location: Highway 17 to Green Hills Road. 408-438-3251. Sky Park Dog Park. Location: 361 Kings Village Rd, Scotts Valley, CA. Directions: From Highway 17 take the Mount Hermon Road exit. Turn right onto Kings Village Road. At the T intersection with Bluebonnet Lane, turn left to continue on Kings Village Road. Turn into the first paved parking lot on the left. Copyright © 2018 LLASCC. All rights reserved.